With his Autumn and Hater series, British horror/thriller author David Moody reinvented the zombie. With One of Us Will Be Dead by Morning (St. Martin’s Press), he reinvents his Hater series. This book should be read as a prequel or sidequel to the series, making it worthwhile both for series fans and those looking for a standalone read with series potential. Hater was originally self-published back in the days when eBooks were predominantly PDF files. After Guillermo Del Toro optioned it for film, St. Martin’s Press put it into print and published three additional books, quite a success story. In this world, a substantial portion of the population suddenly changes due a peculiar gene, becoming hateful of anybody who isn’t changed. It’s the end of the world, not with a bang, not with a whimper, but a bloodbath of epic proportions. Hater has one of the most interesting twists in a work of fiction, and its ending is both violent and exultant. In One of Us Will Be Dead by Morning, the apocalypse hasn’t started yet. A group of executives working for a business owned by Ronan have gone to the Island of Skek, a remote patch of rock in the North Sea where Hazelton Adventures runs wilderness training and team-building programs. The executives, including the introverted Matt who wants to get home to his wife, grumble and complain as the week comes to a close. When a co-worker dies with the cause unclear as to accident or murder, tensions rise, made worse by the fact they can’t raise anybody on the mainland by radio. Then the boat that’s supposed to bring the next group and get them home crashes into the beach, filled with dead children. What follows is what is great about Moody’s work: a deep dive into the human psychology of fear, paranoia, and survival. His apocalypses aren’t wish-fulfillment shoot-’em-ups but more about average people crumbling or rising to an extraordinary crisis. Denial, anger, bargaining, despair, and finally acceptance—the entire spectrum of human reactions to crisis is on full display in his novels. One of Us Will Be Dead by Morning is no exception as Matt and the island’s other people find themselves cut off and at each other’s throats. While the first two Hater sequels (Dog Blood and Them or Us) veered off into the big picture, Moody’s latest gets back to the series’ roots by isolating a group of people, introducing them to the apocalypse, and then putting them through the wringer of need, uncertainty, and survival. The writing is crisp and the voice strong, though the first act takes its time to give us particularly likeable people to root for. There are a lot of characters, which takes a little effort to track. That and the use of omniscient narration, often in the same scene, makes it difficult to determine a clear protagonist early on. There’s a small lost opportunity in that the interoffice relationships could have been explored a little further to explain the ample antagonisms, which works so well in Mayhem (2017), and differentiate the corporate employees from the adventure staff. Once the body count rises and the central conflict crystalizes, however, the story comes together beautifully around a clear protagonist, enormous stakes, horrifying antagonist, and emotional wringer for all as trust becomes dangerous. The pace ramps up to that of a thriller. All the while, Moody rarely, if ever, cuts corners, always favoring a gritty realism and emotional complexity to make his characters, their decision-making, and their world more realistic—and his monsters all the more fantastic for it. There’s enough violence to satisfy even the jaded, though it’s never gratuitous. The ending delivers a morally ambiguous punch. 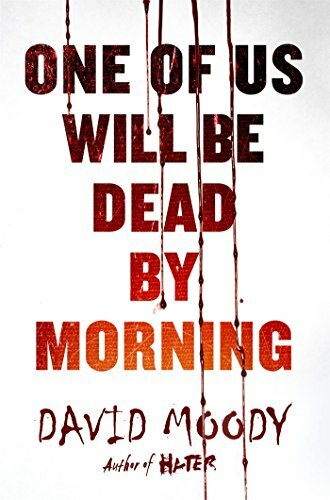 Overall, One of Us Will Be Dead by Morning is one of Moody’s best, presenting an original apocalyptic world where one would never want to live, but one that’s plenty fun to visit in fiction. Let’s hope this revitalization of the Hater series means we’ll get even more of these stories from this notable British author. Craig DiLouie is a prolific author of popular thriller, apocalyptic/horror, science fiction, and fantasy. His novels have been nominated for iconic literary honors such as the Bram Stoker Award.